On the census of the year 1900 in Seattle Mr. Charles E. Thorpe was listed as a lodger in a private home on Denny Way near present-day Seattle Center. By 1905 Mr. Thorpe had become one of the earliest residents of the future Wedgwood neighborhood, where he lived on forty acres of land from NE 80th to 85th Streets, 30th to 35th Avenues NE. Ginseng is also called “manroot” because its shape is like that of the human body. Photo courtesy of Wikipedia. According to census records, Mr. Thorpe was about forty years old when he came to Seattle around the year 1900, and it appears that he had decided to settle on dry land after years of working aboard ships. Stories he told to Wedgwood neighborhood residents of the 1920s indicated that as a young man he had sailed back and forth to China, and he had learned that ginseng was an herb valued in Chinese medicine. 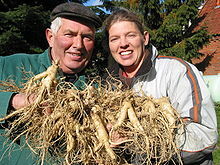 Perhaps Mr. Thorpe chose to settle down in Seattle because Seattle had the right climate for growing ginseng, and Seattle had a merchant Chinese population who would want to have this traditional herb in their medicine shops. Mr. Thorpe’s signature (top line) in the tax assessment roll of the year 1925, showing that he paid the property taxes himself. Tax assessment rolls are kept at the Puget Sound Regional Archives, Bellevue. In the early years of the 1900s property tax assessment records showed the names of various people who owned land in Wedgwood, but no taxable structures were noted, which meant that no one lived on-site. It was common for people to buy land as an investment rather than putting their money in banks, in hopes that the land would grow in value. In the year 1900, part of what would become Mr. Thorpe’s ginseng farm land in Wedgwood was owned by a woman named Mrs. Kelsey. On the census of 1900 she is shown living as a lodger in a house next door to Mr. Thorpe’s residence on Denny Way. We can speculate that it may have been this contact with Mrs. Kelsey which led Mr. Thorpe to buy her land in the remote northeast, outside of the Seattle city limits in those years. Another connection between Mr. Thorpe and his land purchase might have been the attorney and real estate dealer R.J. Huston. Huston is shown on tax records as the representative who paid the property taxes for Mrs. Kelsey in 1900, and again in 1905 after Mr. Thorpe became owner. Since property taxes were paid in-person in those days, it was common for a representative to go and pay on behalf of the property owner. Banks, attorneys or other investors did this as a service when they had loaned money and wanted to protect their investment in land by making sure that the taxes were paid. In 1905 after Mr. Thorpe became owner, the value of his forty acres in Wedgwood was $1500 and the property tax was $49.50, as shown in the columns of the Tax Assessment Rolls for that year. By 1910 there was a big jump in the value of Mr. Thorpe’s land as the taxes that year were $293.60 and included a “taxable structure” worth $360. This was the log cabin which Mr. Thorpe had built to live in, and the increase in the assessed value of the land showed that he had begun his ginseng farm. Mr. Thorpe also removed the registration of his land from the plat records of the Mary J. Chandler’s Addition to Seattle. Mr. Thorpe’s land, which had comprised the eastern half of the Mary J. Chandler plat, as of 1905 became listed as unplatted land, showing that it was intended for farm use and not for residential lots. This photo was taken in about 1927 and shows 35th Ave NE at about NE 81st Street, where Dutch immigrant teenagers sat on the log marker to the entrance of Mr. Thorpe’s property. Mr. Thorpe’s log cabin was located west of 35th Avenue NE at approximately NE 81st Street. There were no streets put through on his property and the only place-marker was a driveway off of 35th Avenue NE, which in those days was a narrow dirt track. Mr. Thorpe cleared part of his land and planted ginseng under latticework called “sheds” to protect the plants from direct sunlight. Mr. Thorpe lived there for the next 25 years and seemed able to support himself with his ginseng crop. He was known for his pioneer lifestyle, including building the log cabin, living without electricity or running water, and teaching children of the neighborhood to make archery bows out of yew branches. In 1929 Mr. Thorpe sold his property to the Jesuits of Seattle University, who planned to move the university to the site. That plan was never realized, and one can only imagine how differently the neighborhood would have developed if Seattle University had moved to Wedgwood. From 1929 until the Jesuits sold the land in 1940, each Sunday a priest would travel out to Wedgwood from Seattle University to hold mass in the Chapel of St. Ignatius, as they had renamed Mr. Thorpe’s log cabin. The 1930 Kroll Publishers map shows plats of lands and owners. The pink area marked Mary Chandler is now the Picardo P-Patch. The Seattle College property, formerly Mr. Thorpe’s, was forty acres from NE 80th to 85th Streets, 30th to 35th Avenues NE. In 1940 the Jesuits sold the property to Albert Balch, the developer of Wedgwood. Squares on the house lots show the locations of houses as of 1930. 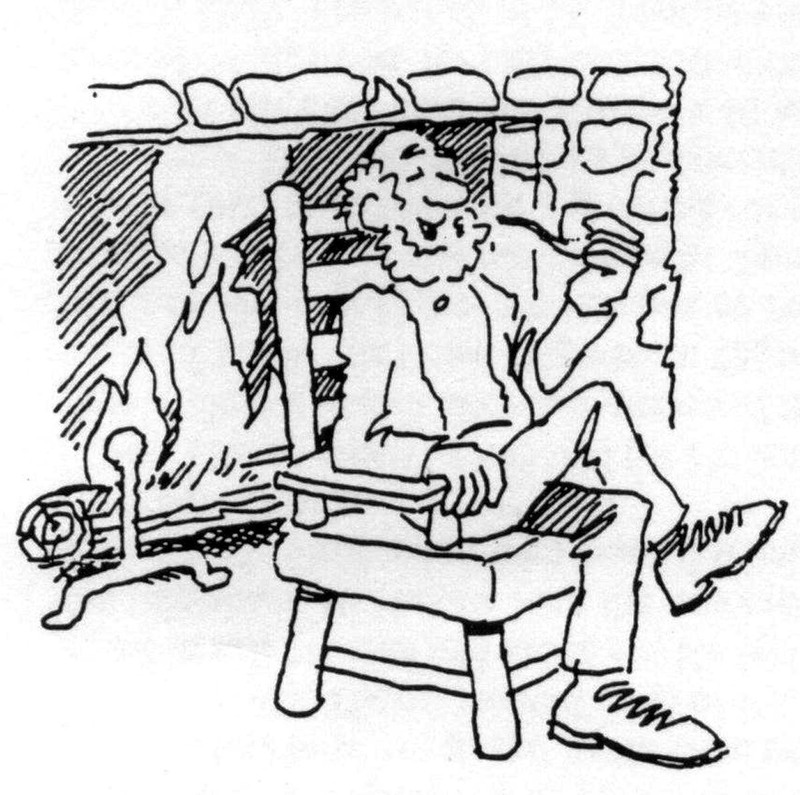 Mr. Thorpe, the ginseng farmer, as depicted in a cartoon by Bob Cram for the Wedgwood neighborhood newsletter of May 1995. As a very young child I visited Mr. Thorpe’s log cabin many times with my parents and grandparents. There was a fireplace all along one side which accommodated full-size logs – half the length or more of the cabin. It was truly an amazing sight to see two men carry in a big log and set it in the fireplace. I think he did his cooking in the fireplace too, as I cannot remember a stove or even running water or a sink in the cabin. Mr. Thorpe had most of the land covered with sheds or roofs where he raised ginseng. With his tales of China, I became fascinated with the Orient and finally in 1981 I was privileged to tour China! Mr. Thorpe always had very interesting stories to tell and when he told them he kept his eyes closed and lived them as he related them. He was a strange but fascinating man, talking of ships to far-away places. We all felt very sad when he sold his property. The sheds’ roofs caved in with no repairs and Mr. Thorpe was gone away, maybe to the Orient. We never found out. I can still see him leaning back in his chair with his eyes closed and relating the interesting tales of China, firelight dancing across the cabin. Balch’s original Wedgwood houses were marked by this entrance on 35th Ave NE at NE 81st Street. It is my belief that he may have gotten the idea from some sort of marker at the entrance to the property, previously placed there by Mr. Thorpe. Historic Sites Index: One of the references to Robert J. Huston, a Seattle attorney and real estate dealer, is a building which he and a co-investor had built in 1925 in Belltown at 2001 Fourth Avenue, which today has the Dahlia Lounge restaurant at the corner of Virginia Street. On-line census and genealogy records tracing Charles Thorpe, via the Seattle Public Library’s website. Our Lady of the Lake Catholic Church, 8900 35th Ave NE, historical records. Recollections of early Wedgwood residents including Marjorie Mock Whitworth, Johnny Hoetmer, Alice Goodwin Hoffmann, Ruth Shauer Jameson and Dora Verhamme Nicklas; these are all people who grew up in the (future) Wedgwood neighborhood and who remembered Mr. Thorpe. Tax assessment rolls of 1900 through 1925, Puget Sound Regional Archives, Bellevue, WA. This entry was posted in churches, farms, ginseng farm and tagged 1920s in Wedgwood, Catholic church in Wedgwood, land use records, Neighborhood History, Seattle. Bookmark the permalink.